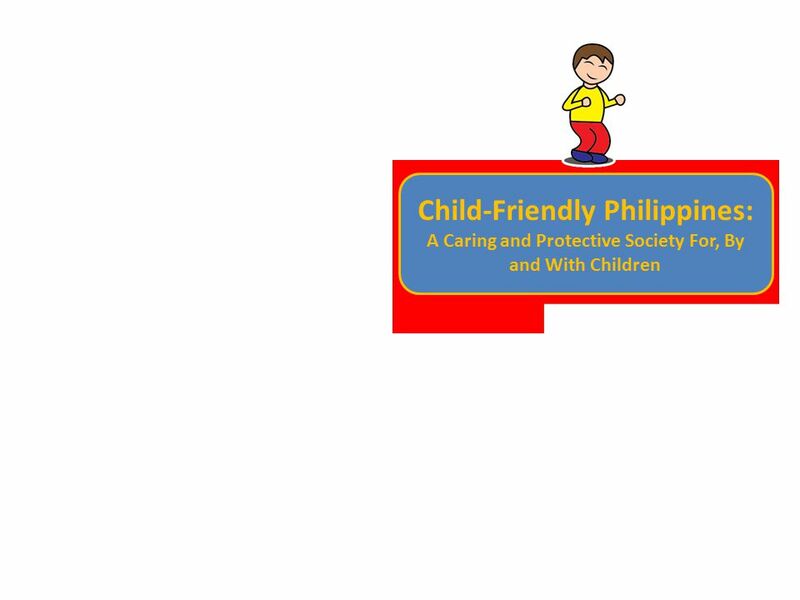 2 It expresses a new vision, a new norm, a new culture for viewing and treating children in Philippine society. Child-Friendly Philippines: A Caring and Protective Society For, By and With Children It is a translation of our commitment to the United Nations Convention on the Rights of the Child A good morning to everyone, to our esteemed guests, Secretary Dinky, Brother Armin, Secretary Ona and of course the very supportive Usec. Panadero; to our partner government agencies, NGOs, local chief executives and LGU representatives, media partners and children, welcome and thank you for coming. We are gathered here today to celebrate new initiatives for our children who, based on the 2010 census, compose 39.6% of the Philippine population. Recent statistics showed that 70% of Filipino children are able to complete their education. A number of children forced into hazardous labor are provided with assistance – educational, livelihood as well as counselling - to better their situations. There is also the emerging paradigm of our children participating in decision-making processes in the family, schools, communities and even, in some of the government structures. However, despite the different advocacies and programs to promote and protect our children, we still hear of media reports on the plight of children as victims of neglect, exploitation, abuse and other forms of violence against them. The perpetrators vary from neighbours, friends, bystanders, and their closest family members. By judging only on the basis of the reports, one might have the impression that the rights of the children in the Philippines are violated. They might also ask, “what is the government doing about these?” or , “Who takes care of the children aside from the families and communities?” The “Child-Friendly Philippines: A Caring and Protective Society for, by, and with the Children” is the advocacy and programming framework adopted by the CWC in response to both national (Child 21 and 2nd NPAC) and international commitments. It is consistent with the UN CRC and it requires the involvement of different stakeholders at various levels. The National Government, with strong support from the LGUs, NGOs, CSOs and other partners, all help promote, protect and fulfil the rights of children. The families are the first line of defense of children against the violation of their rights. They have the responsibilities to provide their children the best start in their life, to provide the conducive environment for development and socialization. 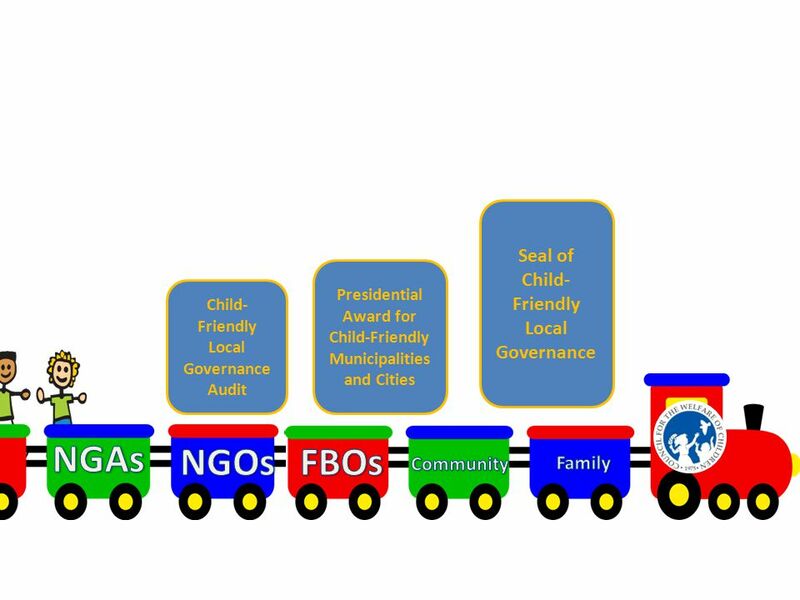 As a reinforcement, the local government units and together with the national government play a big role in the delivery of services that will realize the rights of the children. Which in return will produce positive results for the well being of children. 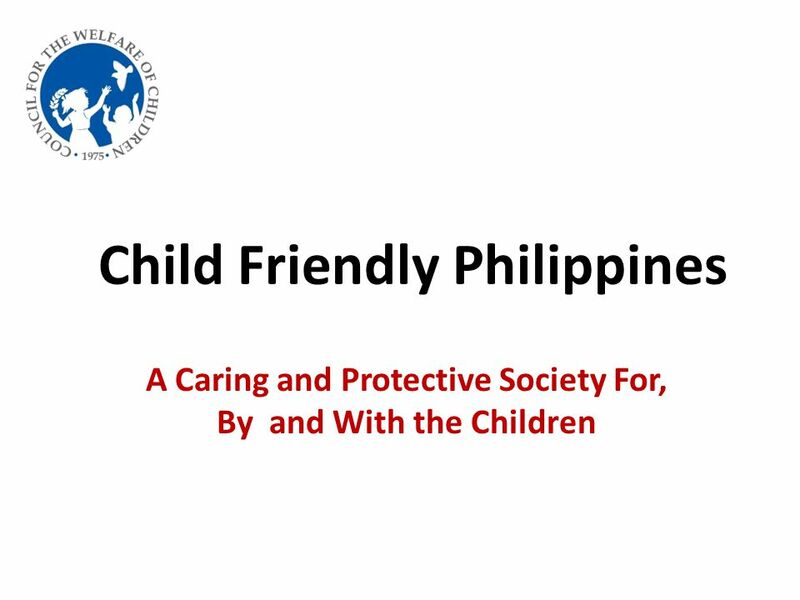 The vision of a Child-Friendly Philippines – A Caring and Protective Society for and by Children (CFP-CPSC), is a translation of our commitment to the Convention on the Rights of the Child which needs to be shared and promoted among all sectors and levels of Philippine society. 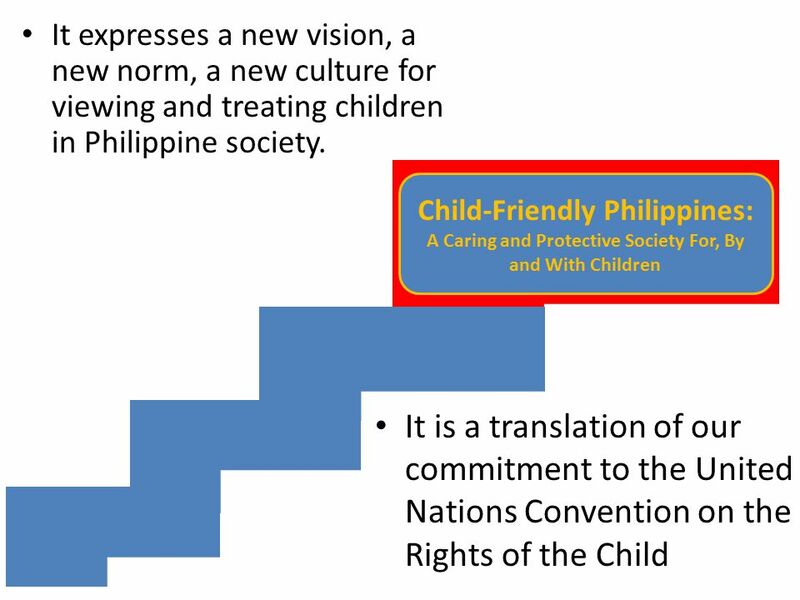 The Child-Friendly Philippines expresses a new vision, a new norm, a new culture for viewing and treating children in Philippine society. Children are human beings with dignity and basic human rights. As vulnerable members of society, children need nurture, care and protection. The CFP-CPSC therefore is an overall framework for all advocacy and programming initiatives for and on behalf of children in the Philippines. The CFP-CPSC culture has the following key elements. 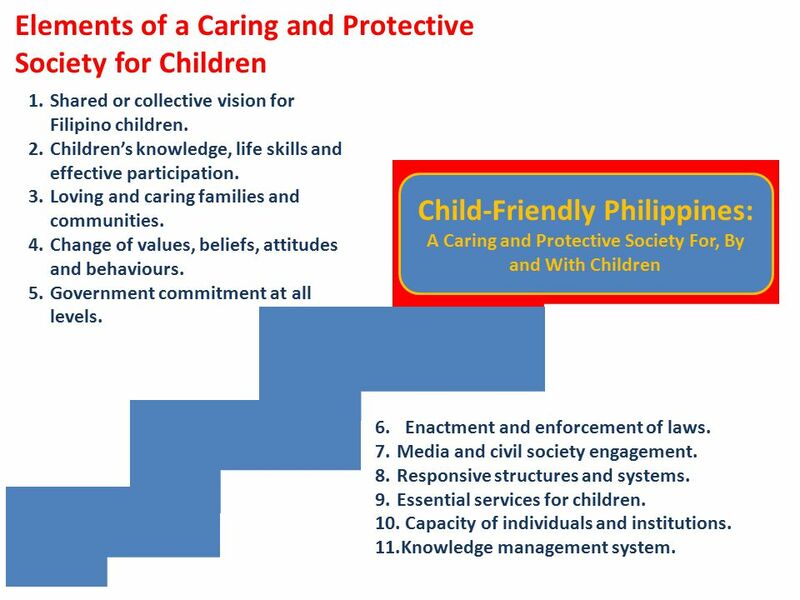 Elements of a Caring and Protective Society for Children Shared or collective vision for Filipino children. Children’s knowledge, life skills and effective participation. Loving and caring families and communities. Change of values, beliefs, attitudes and behaviours. Government commitment at all levels. 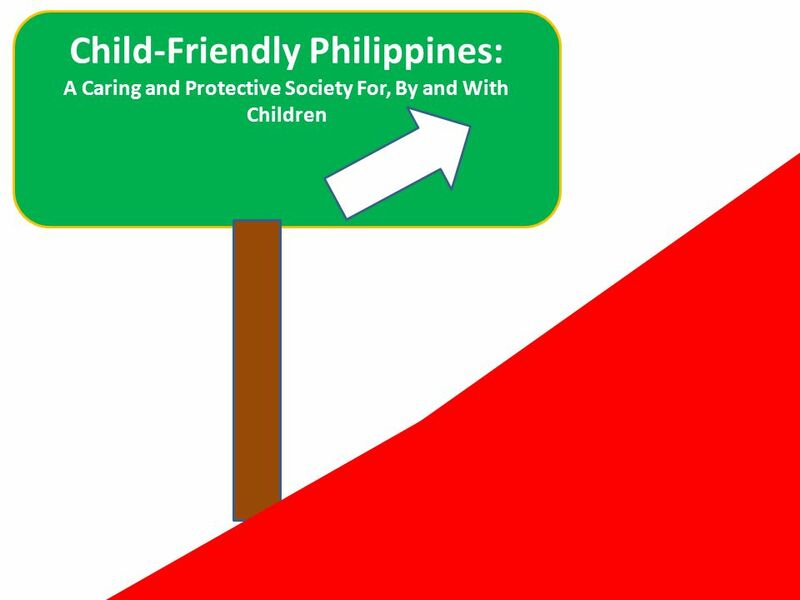 Child-Friendly Philippines: A Caring and Protective Society For, By and With Children Enactment and enforcement of laws. Media and civil society engagement. Responsive structures and systems. Essential services for children. Capacity of individuals and institutions. Knowledge management system. Child rights promotion and child protection strategies and interventions have to be linked to the broader national development plan and strategy. In this way, child rights promotion and child protection interventions can help address the underlying and root causes of continuing violation and denial of children’s rights to survival, development, protection and participation. 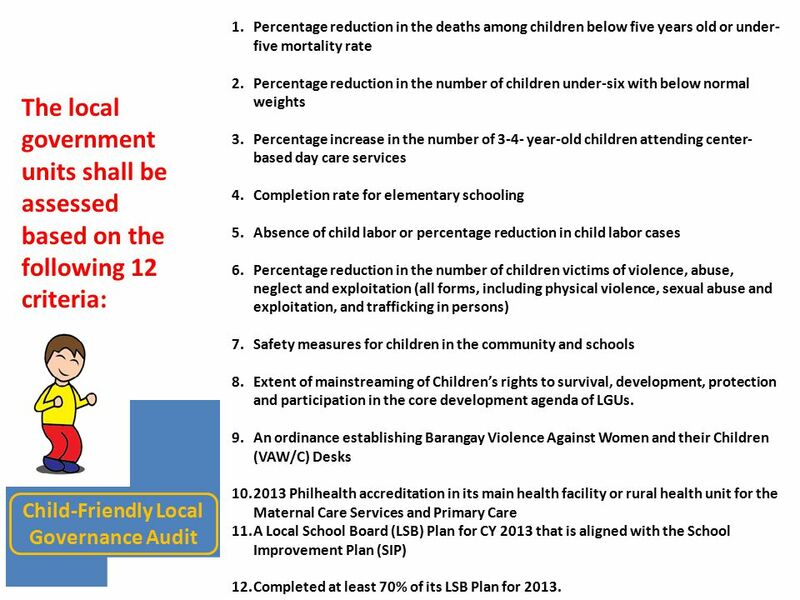 The CFP-CPSC culture has the following key elements: Eleven (11) Essential Elements Shared or collective vision for Filipino children. 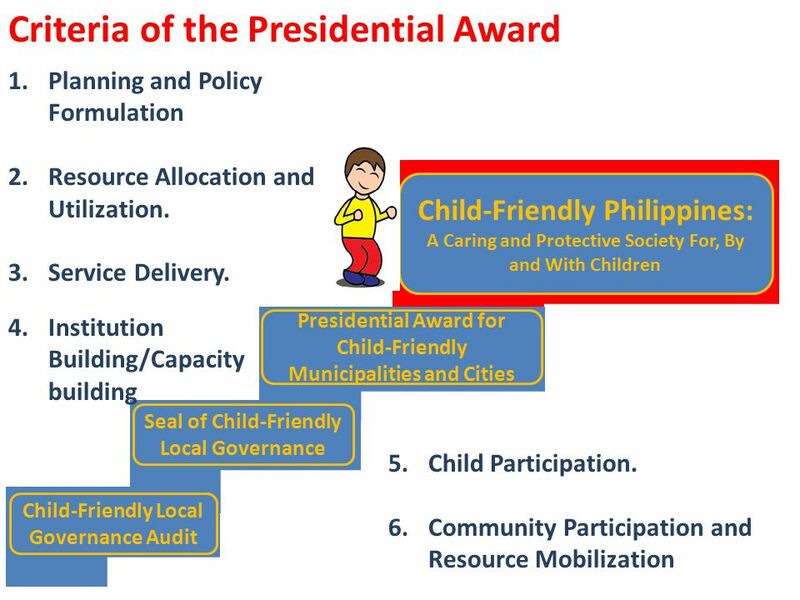 We, as a nation, must embrace a collective vision for our children, i.e., the vision of enshrined in the Philippine National Framework for Plan Development for Children ( ) or Child 21. Children’s knowledge, life skills and effective participation. Our children are provided with knowledge, life skills and opportunities for effective and meaningful participation in matters that affect them. Loving and caring families and communities. Families and communities strive to become more loving, caring, nurturing and protective of their children. Change of values, beliefs, attitudes and behaviours. Cultural beliefs, values, attitudes and behaviours that lead to violations of children’s rights including abuse, violence, exploitation, neglect and discrimination should be transformed into positive values of caring and protecting individual groups and communities. Government commitment at all levels. The government – at national, sub-national, and local levels – is truly committed to child rights promotion and child protection and puts children at the center of its development agenda. Enactment and enforcement of laws. Appropriate laws for the care and protection of children are enacted and are effectively and consistently enforced. Media and civil society engagement. The media and civil society groups are actively engaged in open and free discussion and responsible reporting on child rights violations. Responsive structures and systems. Functional structures and systems for child rights promotion and child protection are in place at all levels. Essential services for children. Quality basic and specialized services are available and accessible to all children without discrimination. Capacity of individuals and institutions. Individual and institutional capacities for child rights advocacy and programming are constantly upgraded. Knowledge management system. Monitoring and evaluation, research, reporting and knowledge management systems on children are operational and well-coordinated at all levels. These elements are closely inter-linked. 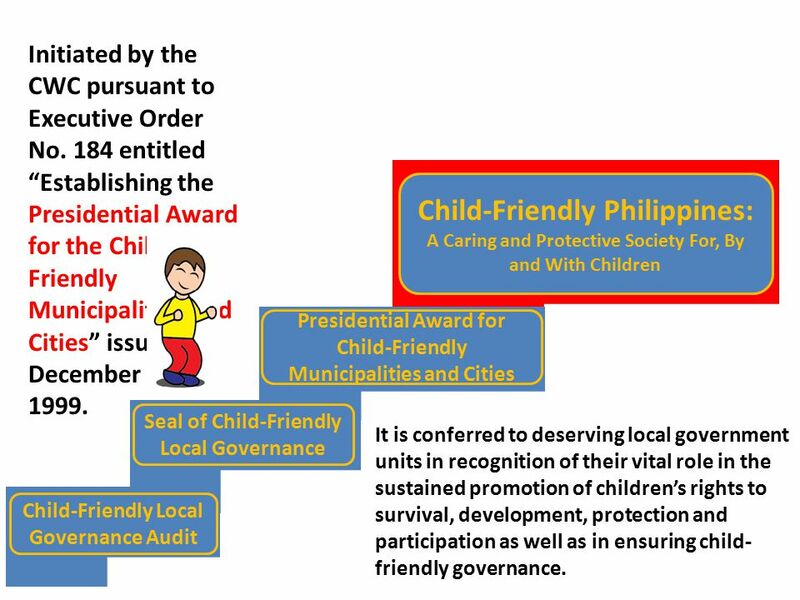 Presidential Award for Child-Friendly Municipalities and Cities Child-Friendly Local Governance Audit NGAs NGOs FBOs Community Family At this moment, the CWC is encouraging all to join us in this journey with the Filipino Children towards a Child-Friendly Philippines: A Caring ad Protective Society For, By and With Children. Download ppt "Child Friendly Philippines"
1 THE RIGHTS-RESPECTING SCHOOLS AWARD. 2 THE CRC AS A GUIDE TO LIVING The vision: A Rights Respecting School with the values of the Convention on the. 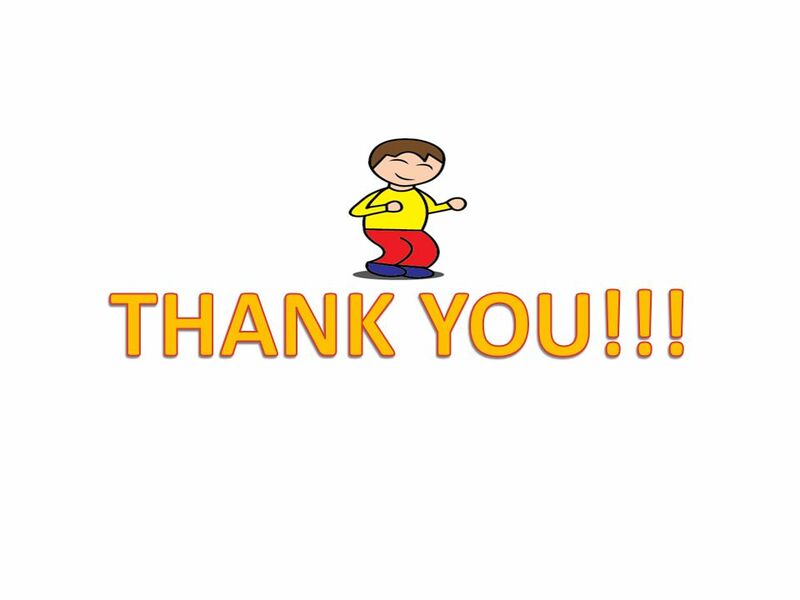 1 EU/UNICEF project to end torture and ill-treatment against children. Current challenges for addressing gender-based violence James L. Lang Regional Advisor UNDP Asia-Pacific United Nations Development Programme.